WE WILL BE LISTING MONTHLY SPECIALS HERE, AS A SEASONAL REMINDER OF POSSIBLE MAINTENANCE YOU SHOULD CONSIDER. 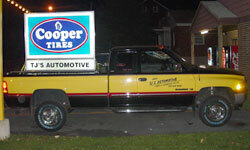 BE AWARE, WE USE WAGNER BRAKE PRODUCTS AND COOPER TIRES. NO SACRIFICE ON QUALITY HERE! REMEMBER, CHEAPER IS NOT BETTER WHEN IT COMES TO BRAKES AND TIRES. BELIEVE IT OR NOT, THEY ARE THE TWO MOST IMPORTANT THINGS OF YOUR CAR! WE HAVE AN IN-HOUSE LOTTERY WE JUST STARTED. WE HAVE 35 TICKETS AT A TIME FOR A 35 DOLLAR OIL CHANGE. EVERY 35 AT A DOLLAR GETS ONE WINNER. $35 PUT TO YOUR SERVICE. ALWAYS A WINNER. ALSO 50 TICKETS AT A TIME FOR A 50 DOLLAR SERVICE VOUCHER. EVERY 50 AT A DOLLAR GETS ONE WINNER. $50 PUT TO YOUR SERVICE. ALWAYS A WINNER. COME VISIT US AND GET YOURS. WINNERS WILL BE LISTED RIGHT HERE TOO! * ONE PROMOTION OR COUPON AT A TIME PLEASE, UNLESS SPECIFIED OTHERWISE.